Are Welders Being Exposed To Harmful Levels Of Zinc Oxide? Exposure to zinc oxide can cause ‘metal fume fever’, an illness known for its flu-like symptoms. 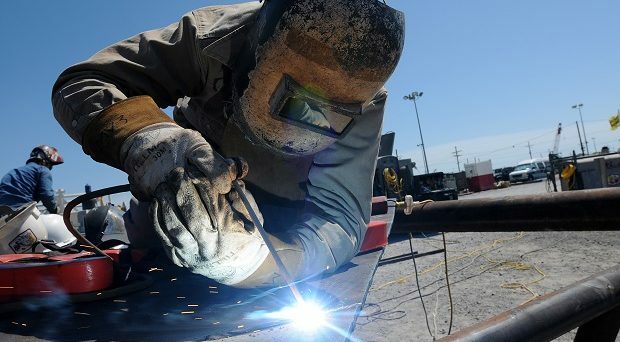 Welders who work with thermal cutting, welding, and melting are often exposed to zinc oxide which is produced in the fumes when certain metals are heated. Workers in this field have set occupational exposure limits to prevent harmful exposure. And yet, a recent study published in Particle and Fibre Toxicology has shown adverse effects far below the concentration of the current exposure limit. In this Q&A, Dr. Christian Monsé, first author of the study, tells us more about the importance of this issue, and whether there is a need for re-evaluation of occupational exposure limits for zinc oxide in the workplace. I majored in Chemistry and went on to do my PhD in inorganic chemistry at the Ruhr-Universität Bochum. I became interested in the field of occupational medicine rather indirectly. I currently work at the IPA, where I oversee the construction and operation of an exposure laboratory (ExpoLab). The IPA is well-recognized for the research it does on workers’ health, and a few years ago, ExpoLab was put into operation to investigate acute effects of non-carcinogenic particles and gas atmospheres on human subjects in concentrations typically found at workplaces. Personally, what I find special about occupational medicine is the technical challenge of generating and simulating workplace-related gas and particle atmospheres. Often, no commercial generator systems are available which are needed to create gas or particle atmospheres. In these cases, I have to develop and construct appropriate devices, which although challenging, is extremely motivating and fulfilling. What are the effects of zinc oxide inhalation and what is ‘metal fume fever’? Inhalation of zinc oxide fumes at higher concentrations may have a health impact on the entire body. Besides fever, typical symptoms include throat irritation, cough, minor respiratory symptoms, metallic taste, as well as flu-like symptoms, such as a general feeling of illness, myalgia, arthralgia or headache. Typically, the symptoms occur after a latency period of 4 – 12 hours, and resolve within 48 hours. Tolerance, which may develop after repeated exposures, has been shown to be reversible after several exposure-free days. The symptoms disappear spontaneously within a few hours, but long-term damage is still under discussion. What groups are typically affected by zinc oxide inhalation? People who are typically affected are employees who work with galvanized steel sheets (welders, galvanizers, car makers) or in hot-dip galvanizing plants . In Germany alone, there are over 100,000 such workers. In addition, various thermal processes release zinc oxide fumes meaning many more people may be at risk. Please could you describe the setup of your study, what were you hoping to find? The reason for the study was a proposal by the German MAK Commission to strongly reduce the occupational threshold limit value for zinc. In order to obtain exposure data that would be suitable for the re-evaluation of the zinc limit value, we chose a study design that follows the principle of dose doubling. Concentration ranges between 0 and 2.0 mg/m3 zinc oxide were studied in order to detect small zinc oxide effects. We hoped that we could demonstrate a dose-response relationship of inhaled zinc oxide for various effect parameters and generate data that would be helpful for future discussion on establishing a health-based threshold limit value. Our study took place at our ExpoLab, which has the advantage of allowing us to precisely adjust levels of exposure and to continuously monitor study participants. In addition, we can exclude the influence of unwanted hazardous substances in the air, as well we control and monitor climate conditions. Such control is difficult to maintain at the workplace. All effects are assessed by noninvasive methods and our studies have an extremely high level of safety for the study participants, which is also controlled by external experts and documented by the approval of the ethics committee of the University. How do the findings of your study compare to current exposure guidelines? Do you think these guidelines need to be assessed? In contrast to animal experiments, there are no guidelines for experimental human studies. We are currently setting up an international standard at CEN or ISO level that will harmonize such studies. If you translate “exposure guidelines” into “occupational exposure limits”, our study showed concentration-dependent systemic effects with a concentration of 1 mg/m3 zinc oxide or higher with an exposure duration of 4 hours. Regulatory authorities will have to discuss this result, which may lead to possible modification of the proposed exposure limit of 0.1 mg/m3 zinc in Germany. 0 Response to "Are Welders Being Exposed To Harmful Levels Of Zinc Oxide?"